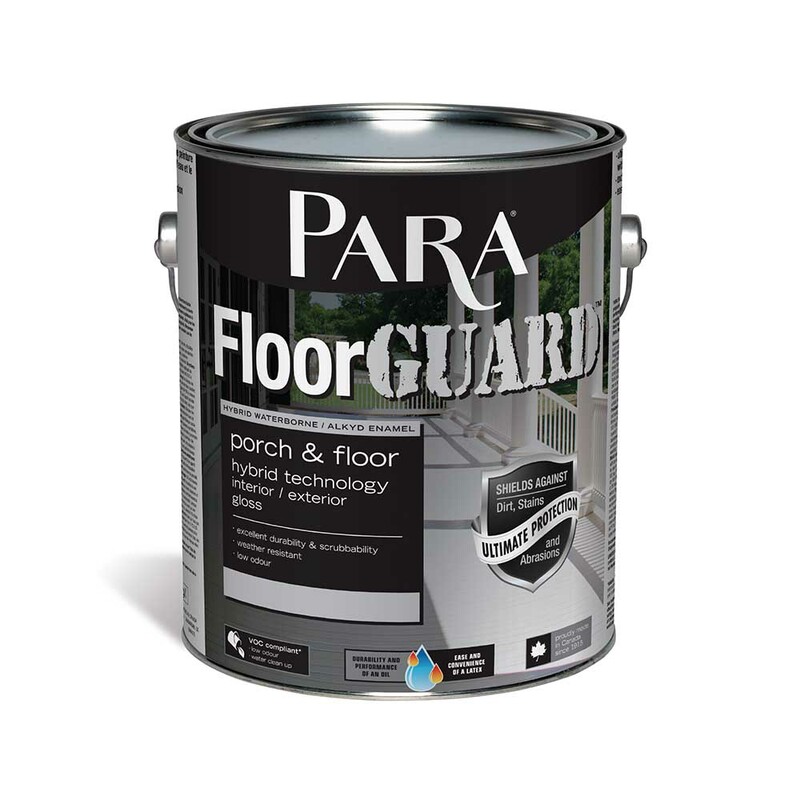 PARA FloorGUARD is a top quality, low VOC (less than 100g/L), hybrid waterborne alkyd/polyurethane enamel porch and floor paint for interior and exterior surfaces. This high performance, super-adherent coating dries quickly to a hard durable gloss finish that provides superior wear, dirt and water resistance for protection from abrasion, foot traffic and weathering. Ideal for properly prepared wood and concrete porches, steps, and basement floors. Volatile organic compounds (VOC) are less than 100 g/L (Including 2 Factory Greys) and complies with the Canadian VOC standards **Please see “Additional Data” below. Thoroughly stir the product before and during application. Apply leaving no bare spots or excess paint. Respect product spread rate. When painting, mark out a section of about 2 x 4 feet with a roller by drawing a “W”. Without lifting the roller from the surface, fill in the “W”. Smooth out the unpainted portion in the direction of the painted portion. Respect the drying time between coats. Low temperatures or high humidity may affect the drying time. Applying two finishing coats will provide better durability and appearance.